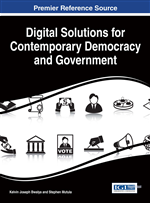 This chapter posits that Governance realignment from e-Government to e-Democracy constitutes a critical context for social and economic development in both developed and developing countries. E-Government and e-Democracy are not new phenomena in most developed countries and some developing countries in Asia and Africa. However, the degrees of political and economic variations between developed and developing countries poses a serious challenge to the efforts towards realignment of governance for social and economic development attainment. The findings in this chapter are that social and economic development lie at the intersection of e-Government and e-Democracy processes of governance realignment. Asymmetry in institutionalisation, and diffusion of e-Democracy amongst countries is widely attributed to economic and political variations in these countries. Unless these differences are skillfully identified and accommodated as such into the development and use models, e-Democracy efforts will not help achieve social and economic development goals, particularly those of developing countries. According to Bekkers and Homburg (2007) digital democracy, e-participation, and greater civic engagement have subsequently been labelled myths of e-government; unlikely to occur without broader changes in the culture of government to be more open, receptive and responsive to civil society views. The concept of e-Government has remained so dynamic and of late has seen the prospects of e-government being idealised as heralding in a new era of democratic involvement, with opportunities for unmediated discussions, direct participation and representation, and greater transparency and accountability through political openness (Coleman and Blumler, 2009; Eggers, 2005; Wong and Welch, 2004). It is argued, however, that governments have placed little emphasis on the development of online practices that enable civic contributions to impact decision-making, instead prioritising information dissemination and service delivery features (O’Toole 2009; Jimenez, Mossberger and Wu, 2012, Cullen, 2006; Jensen, 200). The rapid influx of digital technologies has created immense opportunities for new forms of government–citizen communication. However, it should not be assumed that online government applications will transform democratic structures and practices as rapidly (Seifert, 2006). Keane (2009) suggests that the current form of post-representative democracy has been in development for over 60 years, with this gradual shift the result of increased public involvement in political processes through the introduction of new communication technologies and practices. This chapter highlights that while e-democracy is a slower process than first anticipated, this does not undermine its capacity to facilitate democratic reform that is foundational to social and economic development. Governments that recognise the technological impact on the paradigm shift in democracy are able to use information and communication technologies (ICTs) to address and adapt to increasing external pressures and broadening understandings of political representation and participation (Freeman, J., & Quirke, S. (2013)).